What is Strategic Learning Coaching? Through her company Strategic Learning Connections, Inc. Dr. Lynda has developed the concept of Strategic Learning Coaching. A major emphasis has been to try to “get the word out” that this is an essential but usually neglected component to learning that when done properly can change not only a student’s ability to handle work and assignments in school but can build neural circuits in the brain that can last a lifetime. The major premise is that many students need to be explicitly taught not just “what to learn” but “how to learn”. This is especially important for students with learning differences but helps all students as well. An extensive course was developed to train individuals to become strategic learning coaches. Numerous individuals have directly completed this course and several schools have adopted “Embedded Strategic Learning Coaching” as an integral part of how they teach in daily school operation. Due to limitations on Dr. Lynda’s time, the Strategic Learning Coaching full course is no longer being offered; however, schools may still contact the office to arrange for training and consultation about implementing embedded strategic learning coaching. Be on the lookout for the book on Strategic Learning Coaching which is in the works. In the meantime, you may learn more about this topic by reviewing the information on this website. In most students with learning disabilities or attention deficit, executive function disorders, the prime “disability” is in the ability to formulate strategies to approach academic tasks. This strategy deficit underlies the academic difficulties a student experiences, particularly in the “production” of school work and performance tasks. Many students, therefore, need a “strategic coach” to assist them in learning such strategies so that they can later independently utilize them as they advance in their education. Strategic coaching is different from tutoring. While tutoring generally focuses on specific subject areas, helping the student to gain knowledge in that area, strategic coaching has a different purpose. The purpose is to teach the student to plan and organize a strategy to apply to the completion of a task or for studying for a test. Students with most learning disabilities/attention deficit/ executive function disorders do not do this on their own – at least not very effectively. Whereas other students gradually learn strategies to use on their own, students with learning disabilities need to be directly taught such strategies. A strategic coach would work with the student to develop specific strategies, model and implement the strategy with the student, provide encouragement and monitoring of the use of the strategy, give feedback and help the student self-evaluate the effectiveness of the strategy. It is important for the strategic coach to thoroughly understand the student’s strengths and weaknesses in order to plan the most effective strategies. It is also important not to overwhelm the student with many strategies, rather focus on specific ones to enhance performance with certain tasks. A template approach is often the most successful. For example, the student could learn a specific approach for studying for a test from notes. The steps of the approach could be put into a graphic organizer to illustrate the procedure the student will follow. The coach will work in collaboration with the student to be sure the procedure both highlights strengths, while providing the added reinforcement for weaker processing areas. Once the procedure has been specifically designed, put into a visual format, taught and modeled with the student, it should be applied to an actual learning task in the student’s curriculum. The strategic coach also forms a relationship with the student to increase motivation to perform well. A critical feature of strategic coaching is feedback and self-evaluation of the effectiveness of using the strategy. Self-monitoring and self-evaluation are critical skills for students to learn and are as important as the learning task itself. Once taught, the specific strategy or template should be used again and again whenever the student faces a similar task. Some students may even want to keep their strategy templates in a notebook so they can refer to them for independent use. An important component of strategic coaching is to balance the provision of assistance with the need for the student to work independently. Most students with learning disabilities/ADHD require more external organization and parents have often found themselves in the role of “external organizers” for years. While recognizing the need for more assistance in planning and organizing strategies, it is also important to gradually reduce the amount of external help required. Teaching students strategies that they can learn to independently use is probably the most valuable assistance they can receive. Strategic coaching can be applied to many different cognitive and academic tasks – but be careful to keep it simple. Study the student’s neuropsychological strengths and weaknesses, as well as motivation, to design the most effective approaches. For example, if a student has working memory problems, a visually oriented template will be essential. A student with strength in visual-spatial processing, would also benefit by a visual template, since that is his/her strength. A student with strength in oral language but problems with visual-spatial understanding, still needs a visual template but also needs to have greater emphasis on oral methods of remembering steps or information for tests. 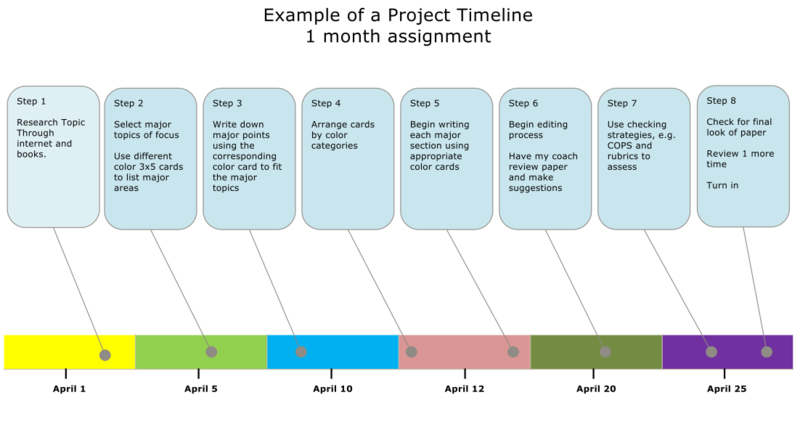 Strategic templates can be designed for tasks such as doing research for a project, writing an essay, giving a presentation, reading for comprehension, studying for a multiple-choice test, studying for an essay test, improving organization on a daily basis, planning a timeline for completion of a project, etc. Incorporated into the templates should be methods for self-monitoring taking into account the student’s own limitations and needs. For example, a rubric which the student can use for any written essay template can serve as an excellent self-monitoring, self-evaluation device. The process of strategic coaching can prepare students to be able to better self manage their own learning both at the present and in the future. What should you expect in a strategic coach? The strategic coach should be able to use information, e.g. from a neuropsychological report, to understand what overall approaches best fit the way the student learns. This coach should be able to develop a supportive, but directive relationship with the student conveying personal interest and concern. A good coach will listen to the student before developing strategies for implementation. The best coach will go slow and focus on one thing at a time, helping the student master that strategy and see success before moving on. The coach should be able to design a specific strategy for a specific task that will fit the needs and interests of the student. Therefore, the coach must be familiar with strategies that have been shown to work effectively. A good coach will refine strategies according to what they have learned about the student through professional resources or from the student himself or herself. The effective coach will work with the student to evaluate how and when the strategy was applied, how well it worked and if any “tweaking” is needed. A great coach will provide reinforcement and share enthusiasm for the student’s success. A great coach will help the student amass a repertoire of strategies that can be referred to repeatedly in the future for independent success. Here is an example of a Strategic Learning Coaching Template. Remember that such templates are only a part of the total method but are integral to student success. Finding a strategic coach can sometimes be difficult. Of course, your best choice is a professional who has been specifically trained as a strategic coach. Occasionally, an individual who could take the time to do independent study in this area and is a highly motivated person, able to develop a strong relationship with the student could be helpful. It is not recommended that parents try to take on this role. Strategic coaching, properly done, can have lifelong benefits for the student who needs it. What age ranges can be helped by strategic learning coaching? Typically, this approach is especially useful for students from the mid-third grade through college. Many students, even at the college level, need help with a strategic learning coach. What is different about strategic learning coaching compared to tutoring? Parents often seek tutoring when the student is having difficulty with a specific subject area. For example, if the student is having difficulty learning to read they may get private tutoring in reading. The job of the tutor is to help the student get better at reading. With strategic learning coaching the focus is not on a particular subject. Rather, it is focused on various repeatable tasks that the student will be exposed to during their years of schooling. It is focused on developing the skill of “how to learn” when involved in these various tasks in school. It recognizes that students learn in different ways and may need to have strategies “tweaked” to the way they learn best. Strategic learning coaching also recognizes that some students with disabilities need added supports – based on their own neurological challenges and they need to learn the strategies that will work best for them. These strategies need to be explicitly taught – they will not just pick them up on their own. They also need to continuously use a model that involves decision-making, planning and organization, template supports, and most importantly, self reflection and self-monitoring – through the guidance of their coach. By combining all of these needed processes at the same time (neurons that fire together, wire together), students build neural connections that allow them to be better the next time – and the next when they are faced with a similar task. Students own their strategies and usually keep them in a notebook or on the computer so that they can reference them independently whenever they are needed. The SLC coach will help them develop the independence to do this. What are some of the tasks that SLC focuses on? Within each of these areas are specific tasks that the student can expect to deal with everyday in school. For example, one task would be strategic reading comprehension as applied to reading a fiction book. This would involve specific strategies to improve comprehension as the student is involved with this task. The specific technique(s) would be chosen according to the student’s neuropsychological challenges, strengths and needs. It would be chosen and taught based on how that child learns best. As another example, in the organizing for study section, a task may be organizing for study as applied to studying from notes. The student may be taught a specific strategy for better note taking, how to organize the information from notes, the best methods for determining the essential information and his or her best methods for studying for a test. He or she would be taught how to do this explicitly after the student has determined with the coach what he would like to accomplish. As he/she is learning the strategy, the student is constantly guided in goal setting, planning, monitoring progress, rethinking, and self reflection. Once the student has learned an effective strategy, its use is promoted and monitored by the coach, it is made into a visual template, and the student evaluates how the strategy has helped him. The next time he has a task where he needs to study and organize from notes, he will have a readily available method to do so. Can you give me an example of how this would apply to a student with a particular learning disability or challenge? Let’s say you have a child who has been diagnosed with a nonverbal learning disability. These students often have difficulty in areas involving visual-spatial ability, in formulating ideas and strategies in novel situations, in picking up on nonverbal social cues and being able to flexibly shift approaches in problem-solving. In academic areas they often do well in directly taught reading skills such as word recognition and phonetic decoding skills and in spelling and their relative strength in language skills can often mask significant underlying problems. They have motor problems so that handwriting is often problematic and typically by the third grade they start to encounter major problems as the demands for self organization increase. They usually have notable problems with written expression, with the conceptual aspects of math, with reading comprehension and in dealing with more complex academic and social situations. They can often be forgetful because they have problems with visual memory and visualizing approaches to tasks, factors that are highly important in organization of material. These students may have done quite well in early years in school where the emphasis was on the decoding skills of reading, but start to have much more difficulty after these early years and are prone to anxiety. These students tend to be much more detail oriented and therefore can remember details of what they read but may not be able to get the big picture. They will tend to do better with verbal methods of guiding their learning, but strongly need visual cues and templates to compensate for their problems in visual-spatial learning. Such students will tend to do better in situations that are distinct and factual, but will have more difficulty in open-ended situations where they must generate ideas on their own or pull discrete information together. They may also have difficulty in reading comprehension tasks where they have to take the perspective of others. A strategic learning coach would define those tasks that the student is having the most difficulty with in school and devise, with the student, those strategies that are most tailored to the way he learns. He likely would be taught to use talk aloud strategies for organizing and remembering information and would also be taught to use visual templates with color to organize and promote visualization of information. Emphasis would likely be placed on mnemonic strategies for remembering information and specific strategies would be developed to improve math understanding, for organizing information for written expression and models to follow when involved in organizing to do a project or presentation. Many students with learning disabilities such as this need repeated use of specific strategies to build the neural connections necessary for mastery. When self reflection and step-by-step organization is built in to the strategy it becomes a part of what the student’s brain learns to do. Students with various disabilities have different ways of learning but they all share problems with developing strategies on their own. Therefore, the basic coaching model is effective for all and can be tweaked to meet the needs of individual students. My child doesn't have a diagnosed learning disability or ADHD, but is struggling in school particularly with organization. Is this a good approach for him? Yes. With a targeted approach – focused on tasks that are causing him difficulty in school, he can learn strategies to help him. Once mastered, he will gain confidence in his ability to do things independently. This sounds like a good approach for any student. Can all kids be helped by this approach? Absolutely. Students develop at different rates whether they have a learning disability or not. Helping students feel confident in strategies to approach tasks, to learn what works best for them and to feel success should be what learning is all about. However, often in school there is more focus on “what” students need to learn rather than “how” to learn. To help address this problem Strategic Learning Connections Inc. has developed a training course for schools for “embedding” the strategic learning coaching model and methods into the classroom. Therefore, students can be directly taught “how to learn” at the same time they are being taught what to learn. Still, many students need to work with an individual coach – to be given more attention – in building their skills and to facilitate their own learning. The work of Strategic Learning Connections is dedicated to the memory of Maria-Victoria Boucugnani whose love of learning, compassion, care for others and spirit is an inspiration to all.